The fabric turned out to be not such a great quality (wrinkles easily, weird recovery) so the remaining two yards will be used as a muslin for the cardigan jacket I'm making for the contest. Your new skirt is so cute! I love it when pregnant ladies are stylish. My own sister absolutely refused to wear anything other than black or navy during the last 5-6 months of her pregnancy. Also, I love that picture behind you. Wow, I really love this outfit, from head to toe! 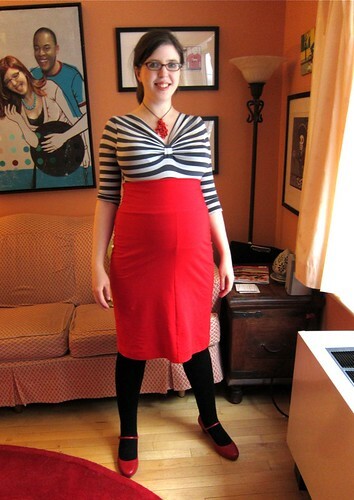 I was really surprised that this late in your pregnancy you decided to make a pencil skirt of all things, but it looks fabulous!